What’s goin on guys, Jerry Neutron here back with a brand new video. 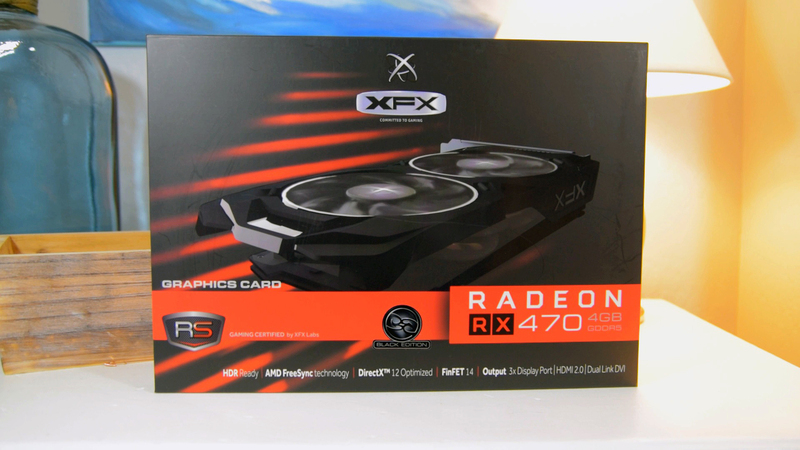 Today on the review table we have another graphics card, this one from XFX, this is the RX 470 4GB edition. 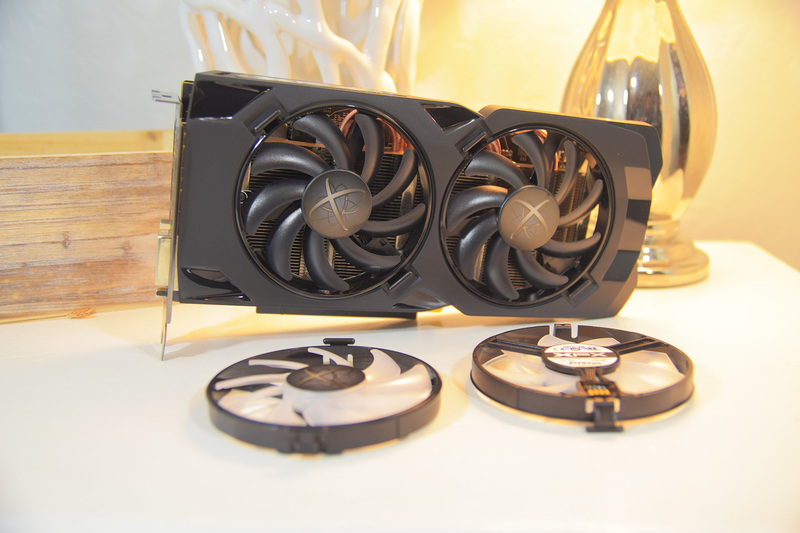 So today we’re gonna take a look at this card as well as these hard swap fans that XFX sent me. 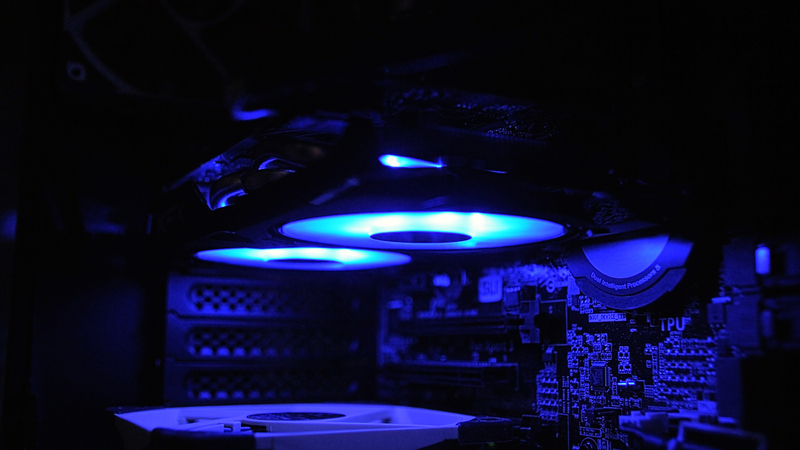 These are interchangeable with the stock fans that come on the graphics card so if you like LED-lit fans they’ve got them in blue, red and white. So we’re gonna take a look at those, along with the performance of the graphics card and then of course in the conclusion I will let you guys know exactly what I think. Let’s go ahead and get into the review! 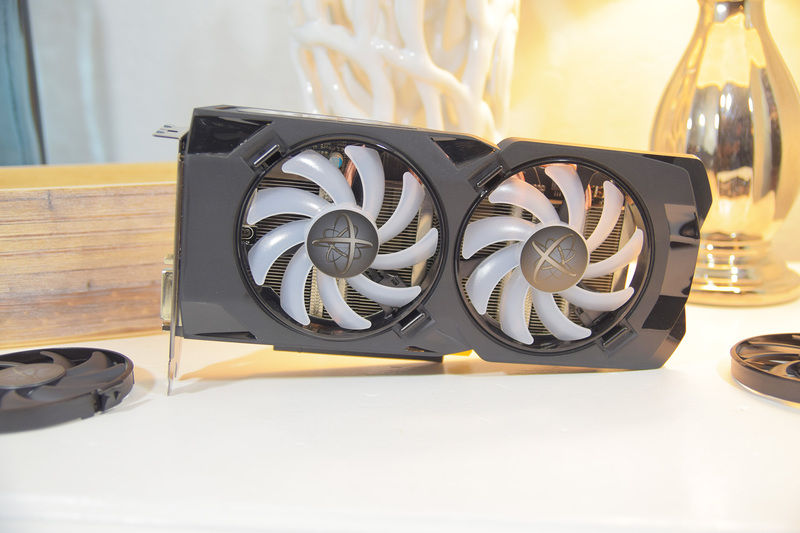 So this is the XFX RX 470 4GB model, it’s also the Black Edition meaning its factory overclocked. 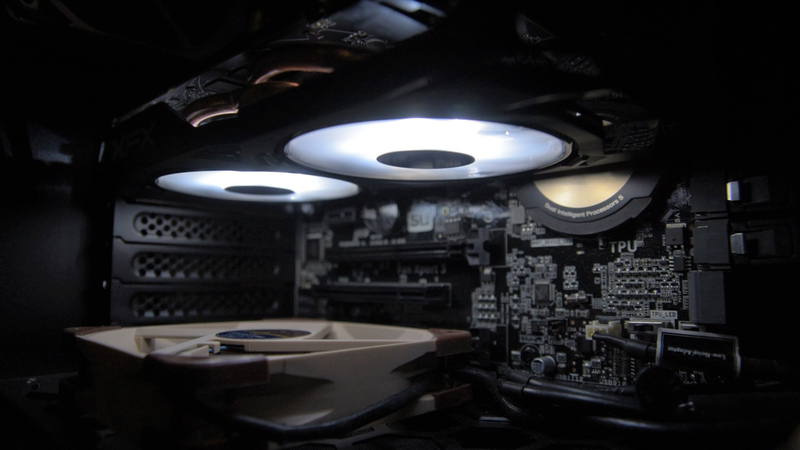 As you can see it’s got a black fan shroud with dual 90mm fans and the nice thing about these is they just pop right out so if you ever need to replace a failed fan you can do so without having to RMA your entire card. Just underneath that you can see the unibody heatsink which not only cools the GPU but the VRMs as well along with 3 copper heatpipes for dissipating heat and a single 6-pin PCI-E connector for powering the card. If we flip the RX 470 over you can see this model has an aluminum backplate with #XFX branding which covers up that ugly PCB and personally I think this a nice touch for a card in this price range. On the I/O side we get 3 display port 1.4 connectors, 1 HDMI 2.0b and 1 Dual Link DVI-D so you get full support for all of the latest display technology. As for lighting, this card does NOT come with any RGB lighting like most cards on the market today. 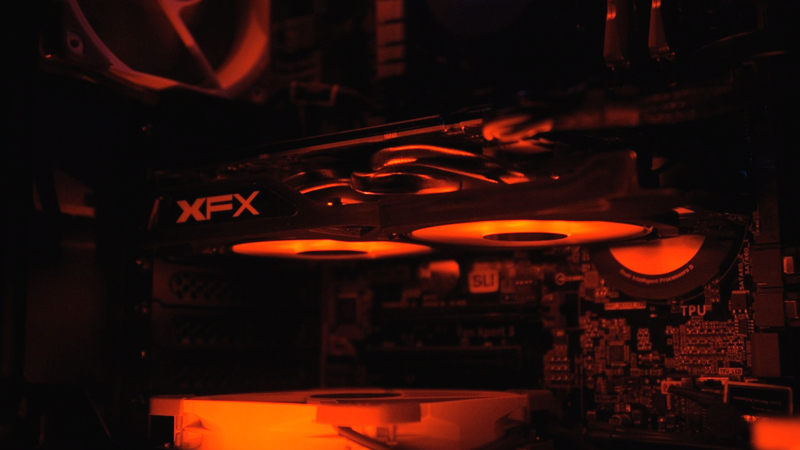 If you want some type of lighting to match your build XFX makes these hard swap fans which you can use in place of your factory ones to add some lighting to your card. Right now they are available in single colors: red, white and blue. So you simply grab the clips on the old fan, pop it out and pop the new ones in and now you have LED lit fans. I would have preferred the card to come stock with RGB lighting BUT it’s not a make or break deal for me so if this ultimately leads to cheaper cards I’m okay with XFX going this route. Now moving on to performance, spec wise this card is based on the Polaris architecture and features 2048 stream processors, a 1256MHz boost clock, no listed base clock although according to AMD the reference base clock is 926 MHz, a 1750 MHz (7000 MHz) memory clock and 4GB of VRAM on a 256-bit bus. One new thing that Polaris brings to the table is the inclusion of a base clock and boost clock. When certain conditions are met the card will increase it’s clock speed beyond the base clock up to the listed boost clock BUT will not go beyond it like Nvidia cards. In testing this RX 470 the clock speed seemed to fluctuate within 100 MHz of the maximum boost clock depending on the game and settings. If you guys click on the card in the top right corner it’ll take you to a video on my second channel of me playing GTA V where you can get a glimpse of the clock speed behavior. This card also features a 0db fan mode which by default is active up until temps reach 55*C. In my case, the InWin 303, the card seemed to idle just 2-3 degrees below that which meant the fans cycled on and off pretty often. The fans weren’t loud at all while running so I chose to set a custom fan curve instead and just have the fans run constantly at a low RPM around idle. Your mileage may vary though depending on ambient temps and case selection. On the other end, while gaming I saw max GPU temps of 77*C after about 15min. 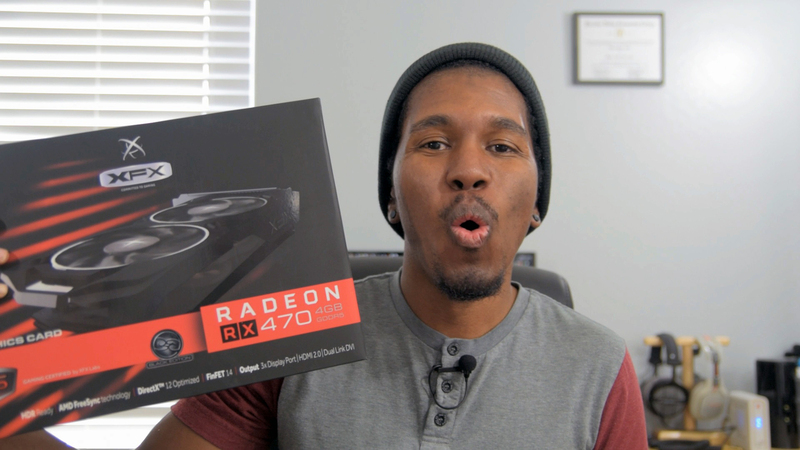 And speaking of gaming, let’s go ahead and dive into the benchmarks. Here are the specs of my test system, I’m running an i7-4790K and 16GB of RAM which should allow the card to perform at its maximum potential. It’s also worth noting that I run all of my benchmarks on the highest preset or max settings or as close as reasonably possible. I do this regardless of the card being tested to show how it performs in a worst case scenario so just keep that in mind when looking at the benchmarks. I also added some results from Battlefield 1 and Overwatch which are not apart of my normal testing suite but I added them because I thought they were relevant for a card of this tier. So as you can see the card performs pretty well being able to max out most games at 1080p. In some of the more graphic intense titles you may need to lower or disable AA if you want to maintain a 60fps average but for the majority you can simply crank the settings up and game on. It also easily outperforms last generations $200ish card while being cheaper which is nice. The 4GB of VRAM didn’t seem to be much of an issue with the games I tested using around 2.5 to 3.5GB at 1080p although it’s difficult to say whether this will become an issue a generation or two from now. One immediate thing you may notice is your inability to enable HD texture packs in certain games due to the amount of VRAM on your card but of course that will vary based on the games you play. Now as for my recommendation, I do like this XFX card although you’ll probably be just fine picking up the non-factory overclocked version. In fact that card can be had right now for around $170 bucks which is a great price for a card in this performance tier. If you’re someone considering a GTX 1050 Ti and you’re looking at partner cards around the $150 price point I would highly encourage you to spend the extra $20 bucks and grab the RX 470 as you’ll see a pretty worthwhile increase in performance. So that’s about it guys, like this video if you enjoyed this type of content, subscribe to the channel if you haven’t already, don’t forget to follow me on Twitter @JerryNeutron and until next time…see ya!